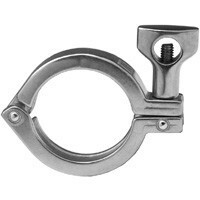 Service pressure ratings are based on the following parameters: matching elastomer gaskets and weld ferrules properly aligned and assembled with the clamps tightened to the required torques. Tests are done hydrostatically with no water hammer or shock loads. Please note the pressure ratings of the described unions are above the recommended pipe line operating pressures.